Cedar Riverside, Minn – Civil Rights Activist, the Rev. 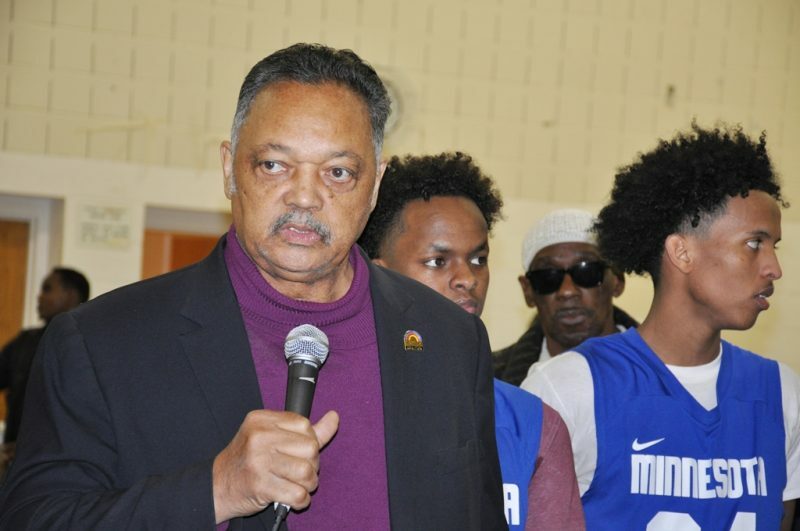 Jesse Jackson, has called on the Somali American community to “keep hope alive” as he expressed concerns over the ongoing debate on immigration, health care, and unemployment in Black communities. Mr. Jackson was very critical about the unfair treatment of immigrants in the U.S., the lack of access to quality health care in minority communities, and the staggering unemployment rate in Black communities. Unemployment rate for Black Americans is 6.8 percent, which is more than the national average of 4.1 percent. 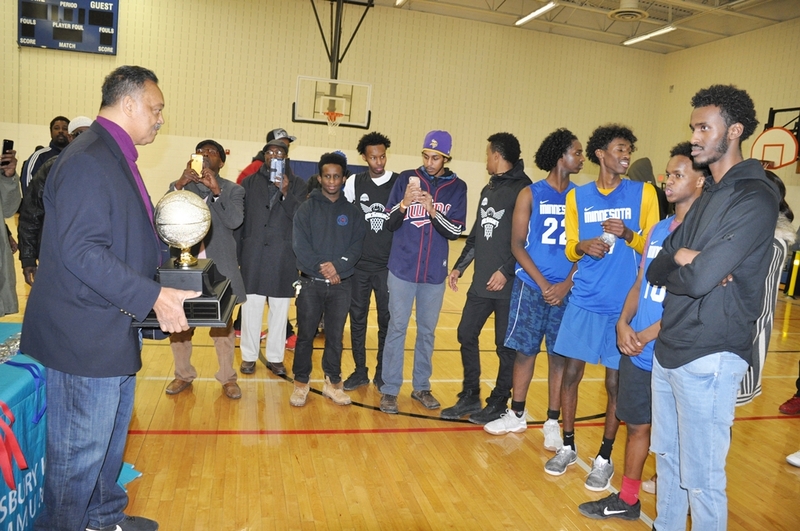 Mr. Jackson made those comments last Saturday, as he honored the Somali-American youth basketball players at Brian Coyle Center. The civil rights activist, who was the guest of honor, presented the championship trophy and other awards to the aspiring basketball players. The St. Paul team took home the top prize, making it the third consecutive wins since 2015. Saturday’s match drew a large crowd in support of the home team from Roseville, but fell short to the visitors, who won by 68-60, earning the St. Paul team the right to keep the coveted trophy permanently. 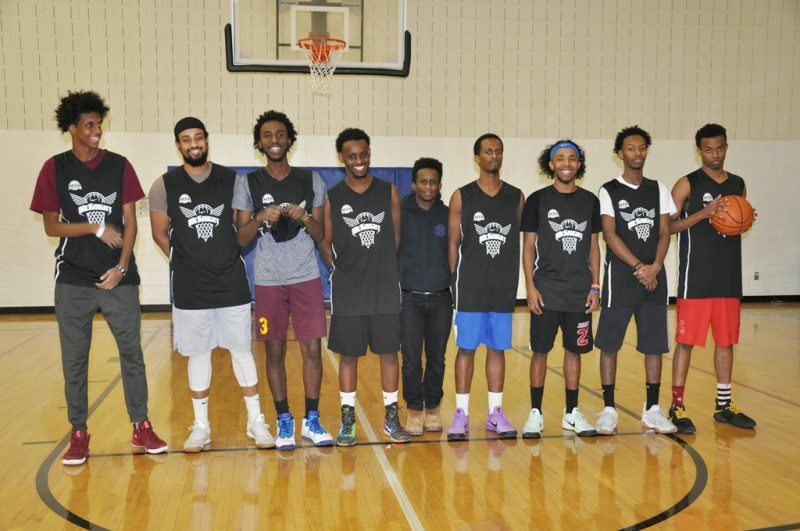 This year’s event brought together eight teams from various Somali communities in the metro area. Farah, like many others who came from various neighborhoods saw the event as a symbol of unity and celebration of the Somali culture. “It was a great environment for me and everybody that was here,” he said. Mahdi Abdi expressed gratitude, and thanked everyone that attended the event. 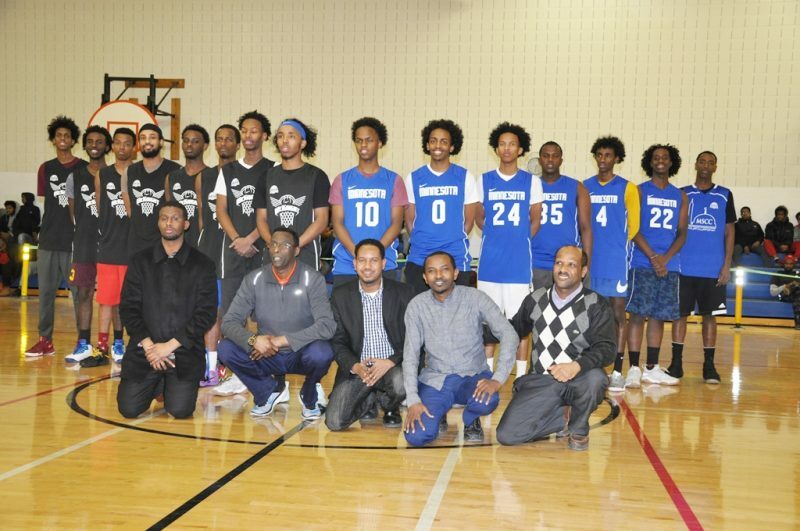 The St. Paul team includes – Mustafa Ali, Adnan Guled, Mohamed Khalif, Jama Bulhan, Amar Abdulkhadir, Abdifatah Mohamed and Abdirahman Arab. Playing for Roseville were Mohamed Salah, Mukhtar Adan, Ali Ali, Mahad Haji, Shirwa Guled, Zakariya Abshir, Mohamed Ali, and Liban Abdi. About 11 fouls were counted against the defending champions – St. Paul, and the Roseville team carried the highest number of 14 fouls. Mr. Abdi said they want to continue the tournament to engage players from 15 to 25 years old. He believed these group of people needed most attention, safe environment, mentors, needing help to keep them away from at risk activities. 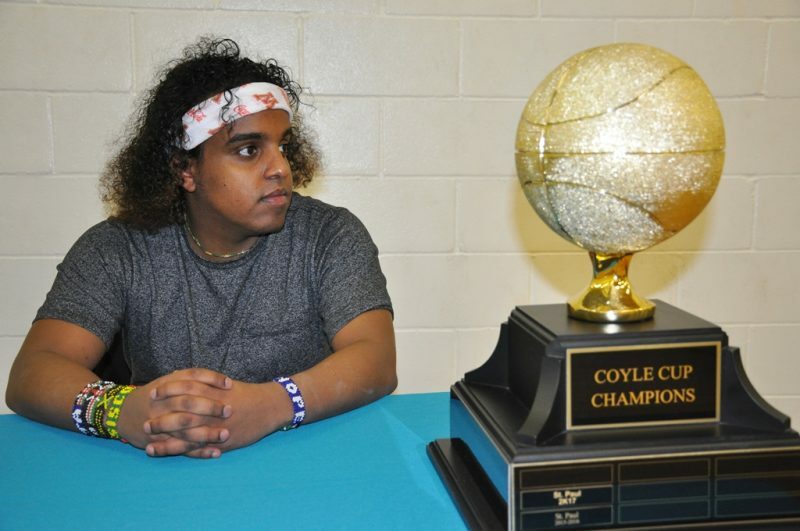 Brain Coyle center continues to support many youths with activities year-round. According to Abdirahman Mukhtar, many of these youths do not have the means to go away for holidays or vacations outside the city while schools are closed. Therefore, they must keep them busy with high quality and structured activities indoors and outside. 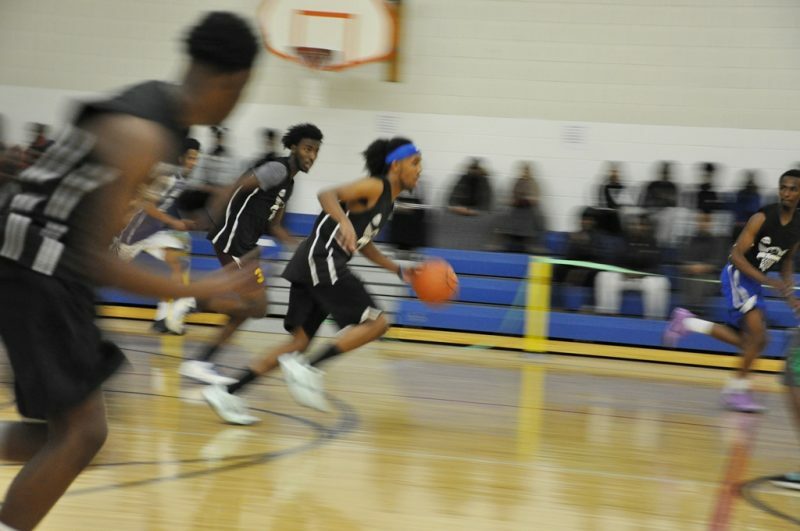 The Brain Coyle Center, once known for series of gun violence and gang attacks among youths, has seen some positive changes as more and more youths turned to activities such as youth’s sports and cultural events. Each year, the tournament has brought together scores of Somali immigrants and their families to a single venue to celebrate their culture. 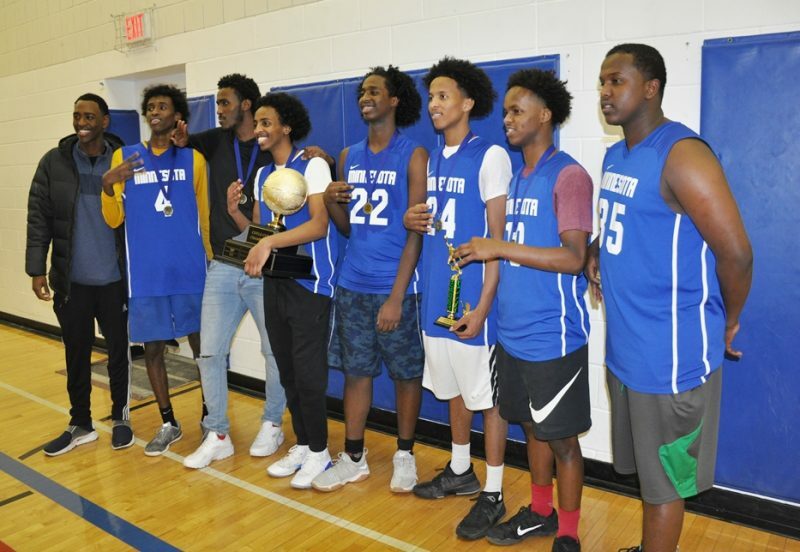 Most of the players and attendees at Saturday’s basketball finals were youths from a new generation of young Somali Americans with a drive to advance themselves and to participate in all spheres of life. The games and tournaments are part of the learning skills for leaderships, access and opportunity for young people according to the organizers. 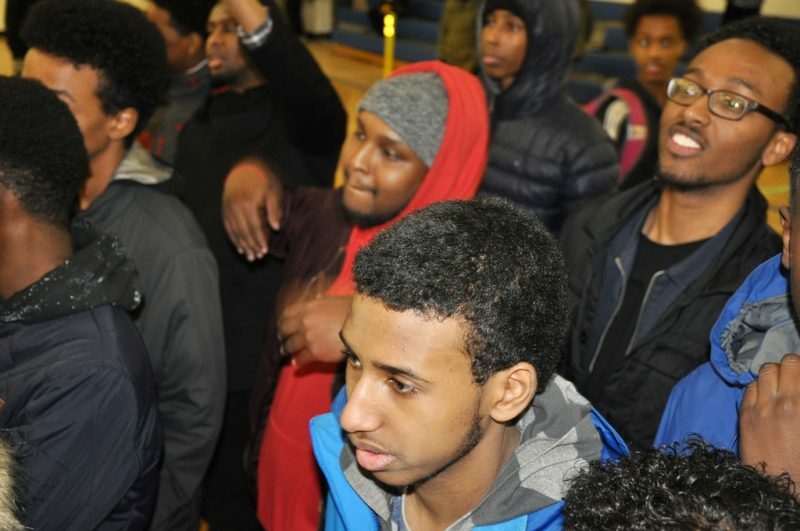 Abdirahman Mukhtar, Youth Program Manager at Brian Coyle Center said most of the youths were given roles to run the game smoothly. He believes it helps them to learn leadership and builds their confidence. Abdurazak Omar, fondly know as Sisco played background Somali music to entertain the players before and after the game. On the table left from Sisco, Abdul Hussein who is FANS scholar from Brian Coyle Center youth program keeps track as scorekeeper. Mukhtar said they look forward to helping more youths at the Center.